Belovezhskaya dense forest (Belovezhskaya Pushcha) — the largest of remained up to now part of the relic primitive wood growing, according to scientists, in the territory of Europe in prehistoric times. The territory of Belovezhskaya Pushcha is divided into two parts – Belarusian and Polish. The public nature protection institution «The National Park «Belovezhskaya Pushcha» is located in the part of the forest that belongs to the Republic of Belarus (the territory of Grodno and Brest regions) as well as in the areas adjacent to the forest. This unique forest consistently attracts the attention of scientists, as there has formed unique in composition of flora and fauna nature complex. Due to the richness and preservation of flora and fauna of Belovezhskaya Pushcha, scientists are able to study the processes that occur in nature. Furthermore Belovezhskaya Pushcha is also an important tourist object. Thousand visitors from the near and far abroad attend The National Park annually. It’s the largest ancient forest in Europe. Here there’re more than a thousand giant trees. Some of these trees were growing in the dense forest before the discovery of America by Columbus. It’s possible to see the extremely rare for Belarus breed of trees — a durmast oak. A natural plain population of a silver fir, unique in Europe, is also here. 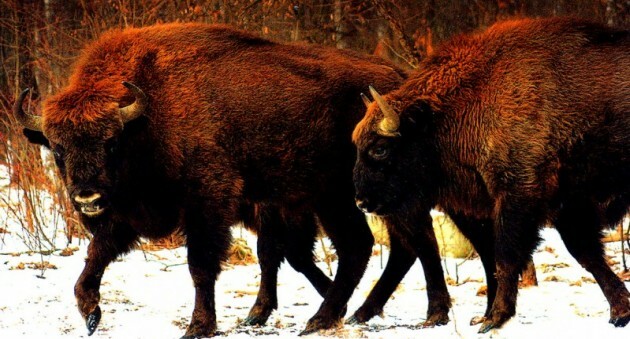 After one of the rarest animals – unique bison– had been destructed in nature, its number was restored in Belovezhskaya Pushcha. Now there’s the biggest bison’s population in the world. Visitors can look after these and many other animals in their natural habitat. There’s the highest New Year's fir-tree in Europe. It’s located at the residence of Santa Claus (Father Frost). There’s one more sight, Viskuli Government House, where the leaders of Belarus, Russia and Ukraine signed the agreements about the dissolution of the Soviet Union and establishing the Commonwealth of Independent States. The trip to Belovezhskaya dense forest becomes an unforgettable event both for children and adults. Hotels and lodges for guests are located in the most picturesque places. With great pleasure our company will help you get to Belovezhskaya Pushcha. You can choose the preferred vehicle for you, as well as the most acceptable option lease this car - with or without a driver. We will do everything we can to make your trip to Belovezhskaya Pushcha. as pleasant and comfortable as possible. A trip to the National Park "Pripyat"
What to see in Minsk? Circus or theater?